Meet different types of people. There are lots of people who can be your friend. You just gotta meet them. For Vera, she has classmates who she wants to be friends with. They all go to the same school and share the same classes, why can’t she become friends with them? When she goes to Russian camp, she thought she found a place with people who can understand her and her experiences because y’know, they’re all Russian like her. These worlds are far different from what she expects them to be. What do you do to get closer to others? You bond over common interests! Vera sees these girls getting along with their dolls and whatnots, and she wants to be apart of that. She tries to become their friends by pretending to like things they like and have things that her family can’t actually afford. In her Russian camp, Vera assumes she’ll easily make friends there because everybody is like her—Russian—but she learns that no, being Russian because other campers are Russian isn’t a sure way to make friends. These girls that she interacts with are older than her and have different priorities. I like how everything that Vera attempts to do to make friends is what I, and everybody else, have experienced. You want these potential friends to like you, so you talk up what you don’t have or you give them things. Vera does this because she really wants these girls to like her. She starts giving them candy—even though it’s not allowed in camp—and she starts drawing pictures for them. When you’re trying to get friends, you do whatever you can, even if it means letting them take advantage of you. It’s what everybody will experience, and I love that Vera had Camp leader Natasha, who served as a wise advisor in what not to do to gain friends. Friendships start unexpectedly. Let it blossom naturally. Vera realized that she can’t force these girls to like her and lets go of that goal, and just hang out and have fun, even if it’s on her own. She embraces who she is. Who will love this graphic novel? Readers who gorgeous art (it’s frickin’ amazing!). People who want to read a relatable experience of a girl trying to make friends. People who want to see a girl trying to deal with her culture. People who want to see this wacky Camp experience. Why you should read Be Prepared? We’ve all been that kid who had trouble making friends some time in our lives. 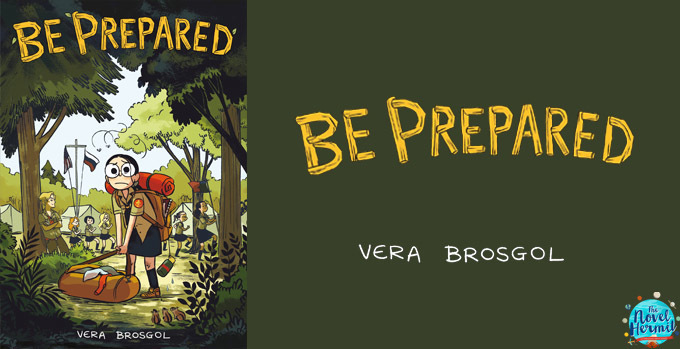 Be Prepared explores how Vera tries to make friends and fit in with kids who aren’t like her—due to the differences in their social economic situations or cultural background. Add to your TBR on Goodreads. Go buy Be Prepared from your local comic book store, or these online retailers: Amazon · Barnes & Noble · The Book Depository · Indigo. Or borrow it from your library. This one sounds really cool! I’ve been wanting to read more books set in summer camp, this one sounds perfect and fun!